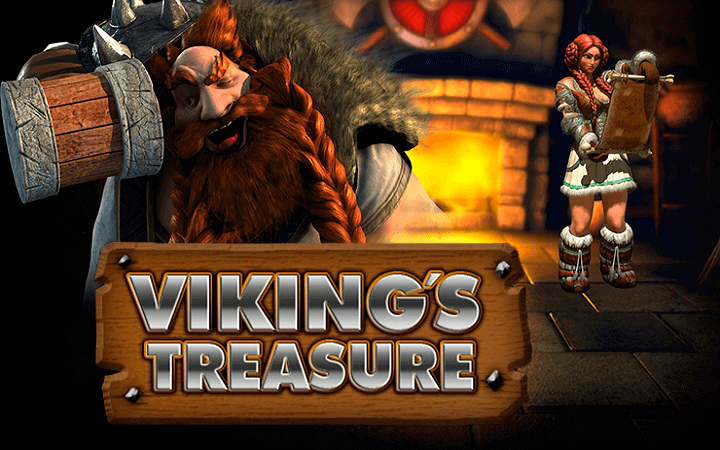 Viking’s Treasure online slot game by NetEnt is a simple and classic video slot game. NetEnt online slots released many titles under this category, they all shared the same ruleset with different themes. Viking’s Treasure casino slot game is a good example of the series; it has mediocre quality graphics, over-the-average winning odds and almost no special symbols. In other words, it is easy to play this game and win, even for the beginners. Viking’s Treasure has 5 reels and 15 pay lines. Only five symbols are unique and high-valued in the game. These symbols consist of pictures of a helmet, a ship, a shield, a maiden and an axe. Ship symbol is the most valuable one with a payout of 1.000 coins. The rest of the symbols are in the form of numbers and letters, which have payout values between 5 and 150 coins. As for special symbols, there are only two: wild and scatter. The wild symbol is shown with a picture of a Viking warrior. It substitutes all other symbols (except scatter) and has a payout value of 10.000 coins, if you manage to land five of them on reels. Wild symbol also doubles your winnings, if it’s used for completion of a winning line. A hand picture filled with golden coins is used for the scatter symbol. Scatter symbols pay up to 500 coins, wherever they land on reels doesn’t matter. They are also used for free spins: Three scatters award you with 15 free games. During the free spins, all multipliers are raised up to x3. Viking’s Treasure supports free slots no download feature. In other words; if you play at Casino Avenue, you can play it for free and without a download. The game uses the standard interface of NetEnt slot games. You can set the coin value by pressing the button with the same name, which changes between 0.01 and 0.50 coin. The maximum bet value is 37.50 coins and you have 5.000 coins to spare in the demo mode. Overall, it is a nice little slot game we can easily recommend to all players who love to play casino slots online.